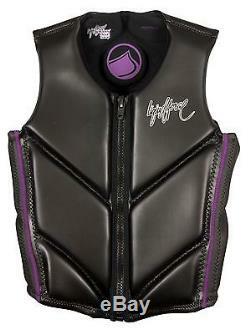 New 2014 Liquid Force Women's Happy Hour Wakeboard Comp Vest. Size Large- fits Chest Size 38" to 41" Factory Sizing. (This Vest is NOT Coast Guard Approved). This brand new vest is made for fun! Zip it up and get the party started. This comp vest feels as good as it looks. With the new style segmented foam this vest is able to conform around curves much better adding a level of comfort never seen before in any style of vests. This is vest is NOT Coast Guard Approved- This is not a life vest! 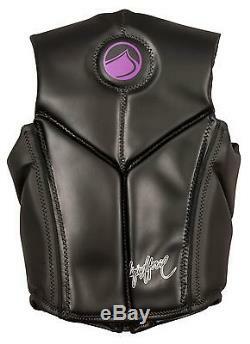 The item "New 2014 Liquid Force Womens Happy Hour Wakeboard Comp Vest- Large Black/Purple" is in sale since Friday, August 15, 2014. This item is in the category "Sporting Goods\Water Sports\Wakeboarding & Waterskiing\Other Wakeboarding/Waterskiing".